Grand Central Life & Style, 9781455536580, 240pp. 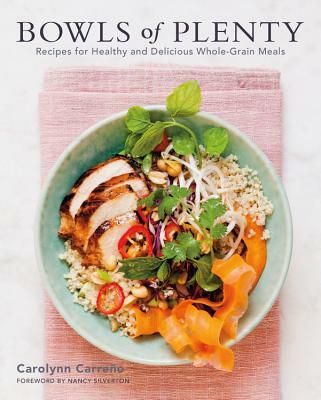 A fresh and flexible approach to grain bowls--thoughtfully structured one-dish meals that marry health and flavor--from James Beard Award-winning journalist and acclaimed cookbook coauthor Carolynn Carreno. Gorgeous, layered, satisfying bowls have become the next wave of healthy eating. From food blogs to Instagram, farm-to-table bistros to chain restaurants, "the bowl" has become part of our culinary vocabulary. And whole grains are not just for hippies and health nuts anymore! Hearty grains like quinoa, farro, millet, and spelt are replacing flour or corn tortillas, bread, pasta, white rice, and mashed potatoes as the base or vehicle for other, richer, more complex ingredients. Carolynn Carreño is a James Beard award-winning food writer. Her work as appeared in Bon Appétit, Food & Wine, Gourmet, Saveur, and the Los Angeles Times. She has coauthored many acclaimed cookbooks, including Nancy Silverton's Mozza at Home and Pat LaFrieda's Meat: Everything There is to Know. Carreno lives in San Diego, CA and New York City. "Carreno has impeccable creds on the seemingly ubiquitous yet still growing phenomenon of one-bowl meals. . . . her take on value-added whole grains is deeply authoritative and inspiringly delicious. . . . [the] determinedly 'flavor first' approach draws on influences modern eaters want."